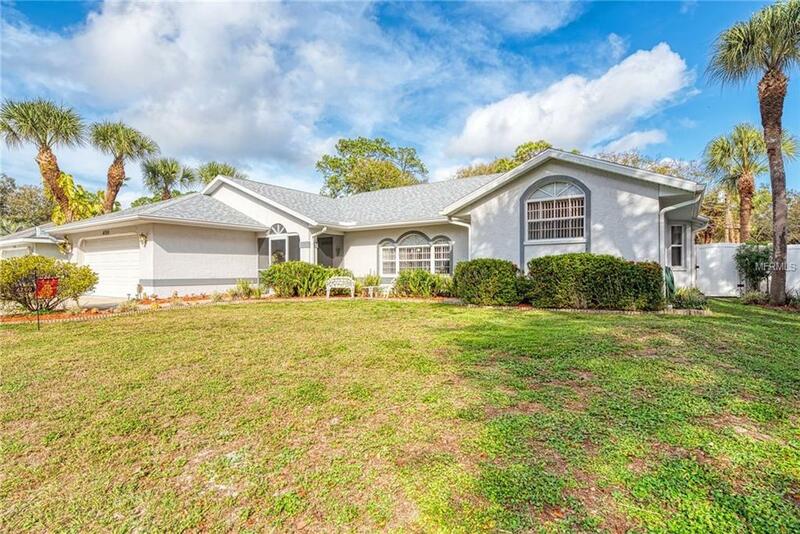 Beautiful 3-bedroom, 2 bath, 2 car garage heated In-Ground Pool home offering additional 80x125 lot in the back (double lot)! Over half acre nestled in a peaceful park like setting with storage shed and 30 amp hook up for the R/V! 2018-dimensional shingle roof newly added. Yard is completely fenced for the pets and nicely landscaped all around. Culvert and skirt in place on 2nd lot to drive the R/v in. Room for the boat too! City water Utility in place. Almost 2000 sq. ft featuring, cathedral ceilings, plant shelving & views of the pool from everywhere. Enjoy spacious Living & Dining room with sliding doors leading to the Pool & a Center Island Kitchen over-looking the cozy family room. Island has glass top stove that has grilling interchangeable option. Built in oven & microwave. Extra full-size freezer in utility rm included. Large Dinette area too. Perfect floor plan for a large family.33 ft covered lanai with upgraded Porcelain tile. Sellers added a home office in the garage area. Newer items: Lennox A/C (6yr). Pool added in (03). New hot water heater (1yr), new kitchen counter, sink, stainless faucet and appliances added (8yr). Many newer items through out the entire home. To many extras to list. Call today. Location is minutes to I-75, shopping & schools. Myakkahatchee environmental park offering Kayaking, canoeing, hiking & more just a close drive away. Wonderful spacious family pool home!